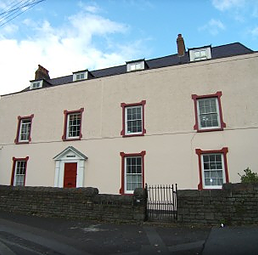 The Sanctuary is situated on the North side of Castle Street, Loughor. Although the fabric of the building dates from the 1700's, the original site, and purpose of the sanctuary are much older. In fact, the existing building displays some older features, including the basement archways and cellars of an earlier building. The Sanctuary was originally built in 1165 by a crusading order known as the Knights Hospitalers. These Knights later united the famous Order of St. John. The siting of the Sanctuary near the site of the Roman station and the Norman Castle emphasis the importance of Llwchwr as an administrative and religious centre in the early Norman period. Local tradition insists that there are secret passages from the Sanctuary to the Castle, and to the old church of St. Michael at Cwrt-y-Carne. These however have not yet been discovered.